Recently Kylie Jenner made news yet again. The scandal? Piercing her five-month-old daughter’s ears. A picture of the baby set off a huge debate amongst parents and non-parents alike regarding ear piercing and whether it should be done at such a young age. One side stated that ear piercing is a rite of passage and should only be done after a child is older, while others stated that the child should have their ears pierced sooner. What seemed to be lacking from the debate was what may be the most obvious question. Are earrings safe and what are the best earrings for babies? Choosing to pierce a child’s ears is a personal one and if a parent chooses to pierce their child’s ears while they are a baby, it’s important to know all the facts prior to the piercing. What Is The Appropriate Age For Ear Piercing? Are Earrings Safe for Babies? What Size Earrings Should Be Used? What Earrings Are Safe For Babies? While ear piercing is a personal decision made by the parents of a child, research indicates that there is an increased risk for infection if a child’s ears are pierced too early. Parents are encouraged to wait at least 6 months to pierce their child’s ears to allow for their immune system to fully develop and have the ability to fight off infection if necessary. In general, earrings are safe for healthy babies. It is important to take into account a child’s age (doctor recommend waiting until the child is at least 6 months), the material used in the piercing, and the child’s ability to heal from the puncture. Parents of children with compromised immune systems should reconsider the decision to pierce their children’s ears, as the piercing will increase the possibility of infection. And while having the earrings in the ear should not be problem on its own, parents should be on the lookout for babies that tug at the earring, as this behavior can inadvertently lead to the child pulling the earring out, or in rare cases, tearing the earlobe, which is not only painful but also increases the risk for infection and the need for repair of the ear. What Size Earrings Should Be Used For Babies? The first time a babies ears are pierced, they must be pierced with studs. Stud earrings are typically a gem set in a metal backing or a gold or silver ball. These are the best earrings for babies as they do not create added weight to the earlobe allowing for it to heal faster and they also minimize the risk of the jewelry getting caught on clothing and irritating the puncture. What Are The Best Earrings For Babies? The best earrings for babies are those that have screw on, flat backing. The backs screw tightly into place, minimizing the risk that the back will come off and the earring will become dislodged. There are many companies that are now making earrings that are baby safe that provide this screw back with the added feature of the back sitting slightly away from the ear, allowing for the earlobe to breathe and reducing the number of times the earring needs to be removed for cleaning. Safety stud earrings, also known as safety back earrings, are very popular starter earrings, especially for babies and young children. These earrings are great because they feature a locking feature which holds the back in place to the earring post, allowing the earring to stay in place in the ear. Some parents prefer to use butterfly backs on their babies earrings. Butterfly backs consist of a flat backing with 2 loops that resemble butterfly wings. They are helpful because they not only create balance for the earring while it is placed in the ear, but it also provides leverage in removing the backing. Butterfly backs may be perfect for parents who are a bit skittish about removing the backing or those with larger hands, as they provide a place to grip and easily pull the backing off without fear of accidentally pinching the child’s ears. 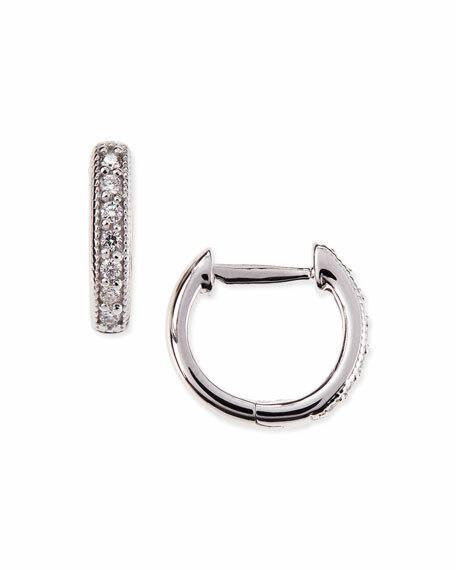 Huggie hoops are another popular earring, which consists of a hinge that locks into place at the top of the earring which allows the post to fit in place without the need for a backing. Experts do not recommend this type of earrings for babies that are younger than 1 year or are newly pierced due to the strain that the added weight from the hoops places on the earlobe. Parents should wait until the piercing is fully healed before attempting to use huggie earrings on their child. Which Type Of Metal Is Best When Choosing Earrings For My Baby? When choosing jewelry for piercing a babies ears, especially those with sensitive skin, it best to opt for surgical grade stainless steel earrings and posts. Other metals tend to contain nickel and cobalt which have been known to cause allergic reactions in many children, so it is best to avoid earrings known to carry these metals. If surgical stainless steel is not an option, look for earrings containing titanium, platinum or 14K gold, as these metals have a low rate of allergic reaction during piercing. It is important to note that just because packaging states one metal on the labeling, it doesn’t always mean that there isn’t a mix of other metals within the jewelry. For this reason, it’s best to have a conversation with the piercer regarding earring options to make sure that you are getting the best metal for your child’s skin and that the earrings are not contaminated with other metals that may cause an allergic reaction. For some parents, choosing to pierce their babies ears is a cultural rite of passage. Piercing can be safe, even for babies. Parents should make sure to do thorough research before they choose to pierce their child’s ears, making sure they choose a reputable piercer and the correct earrings for their child’s ears. When in doubt, parents can also talk to their pediatrician before piercing to ensure that they are following all the correct steps. Armed with the correct knowledge, parents can ensure a safe experience for their little one. Image & Video credits: Howcast, Baby Jewels, Bel Viaggio Designs, Neiman Marcus. I think it completely depends on what the parents think is suitable for their child. Do you guys have a newsletter that I can sign up to?